Can you justify the motives of two groups of chassidim who are in conflict with one another? You mean the Satmerer and the Lubavitcher? When it comes to this we have to know that we are talking about two groups of devoted Jews. There’s no question that the Lubavitcher are devoted Jews and there’s no question that the Satmerer are devoted Jews. I wouldn’t listen to any one party who say the other one is not. There’s no question that both groups have among them people who are full of love for their ideals, people who serve Hashem. And therefore before we enter this subject - and I’ll say it briefly - with the greatest caution. What's meant by the statement in the Gemara, that for everything that a man sees and he didn't utilize to have pleasure, he's going to give in the future an account why he didn't utilize it to have pleasure? Hakadosh Baruch Hu gave us all the phenomena of life, in order to have some benefit from them. Therefore if a man enjoys them… let's say you take this fig that we were talking about, and after studying it, you sample it too! So the lesson of the fig is going to be doubly impressed on your mind. We won't talk about figs we'll talk about apples which are more frequent. You study an apple and you see that it's wrapped in a waterproof wrapper, and beautifully colored, and you study it. And after studying the apple, you study the seeds in the apple, and all these lessons are impressed on your mind, and you're munching the apple at the same time, it's much more fun and you appreciate this lesson much more. It's like studying in a sefer that's written on a delicious biscuit. While you're learning the Gemara you're munching on the margins, you will surely appreciate it more; it's a geshmaka suyga, it's a pleasurable study. That's why Hakadosh Baruch Hu gave us pleasure, because pleasure makes it easier to appreciate the great lessons. That's what it means; all the things that he saw and lo nehene, he didn't utilize—it doesn’t mean that when you pass a pastry store you have to buy all the cakes, loaded down with sugar and fats and syrups-even one cake you cannot eat. So that means you are going to give an account because you didn't eat all the cakes and all the candies? It means that when you pass by and see all the beautiful cakes and beautiful candies, and beautiful fruits, you should see them and have hano'oh from them. Doesn't mean that you have to eat them, you have to have hano'oh. If you didn't have hano'oh from them and appreciate what Hakadosh Baruch Hu is doing for mankind including you, because you could also buy it if you wished. So you are losing the opportunity and osid litein es hadin. That's why it says sichu b'chol niflaosov, talk about all the wonders that you see in this world; there's a lot of work to be done. You have to talk about the beautiful colors of fruits, and the beautiful taste of fruits. Doesn't mean you have to taste them yourself, but if you don't utilize it, so you're not utilizing the world. If a person cannot concentrate during Shemonah Esrei, let him choose one bracha and study from some worthwhile sefer what that bracha means. Otherwise, you don't know what you're saying. Not just the teitch but the real lessons of that bracha. The siddur is one of the great opportunities in life - but you have to know it in order to make use of this opportunity. The siddur is a very profound book so you must find a sefer that explains the ideas clearly; and take one bracha and study it well. And then practice on that one bracha every day until you are able to say it properly. And when you become perfect in that one bracha, then try another one. A man told me, a poor man, that he printed out wedding invitations. He told me that his son-in-law, his future son-in-law, remarked, "It’s not raised lettering. It's cheap. It’s not raised lettering; it’s just black ink." And this poor man, it hurt him very much. A nice son-in-law said it to his future father-in-law. The father-in-law called me on the telephone: "How should I react?" he asked me. You know how to react? By not reacting! It’s a glorious opportunity. We say it every day in shemonei esrei: v'limekalelai - those who make light of me, nafshi sidom - let my soul be silent. Venafshi ke'afar lakol tihyeh - let my soul be like dust to everybody. You know what a glorious opportunity it is when somebody hurts you and you don't react? You swallow it down. Hakadosh Baruch Hu is going to give you such perfection of character. He'll give you happiness in this world. There's a great reward for people who keep their mouths shut. The gemara says: tolah eretz al blimah - Hashem hangs the world on the man or woman who keeps their mouth close. Hashem hangs the world in the merit of the one who is bolem piv b’shaas merivah, one who keeps his mouth shut at the time when there's a quarrel. He doesn't answer back. It's good for your health too by the way. Many times you suddenly hear that this and this man passed away. Is that so? Was he sick? Wasn’t he healthy? No; people don’t that realize he died because of the fight with his wife. That's not in the obituary; it's not mentioned. In the fight with his wife he died. Most cases of excitement that causes strokes are caused by domestic fights. He said something and his wife couldn't take it. He had a fit and his wife couldn’t take it. I know a man who on purpose used to torment his wife. And she passed away. On her deathbed he came to her and asked her for forgiveness. She said she can't forgive him. And I don't blame her. He was a devil. A frum devil; an orthodox devil. And there are women who have killed their husbands; not with a gun, not with weapons; with her mouth. Of course, when she comes to collect the insurance nothing is said about that. She's dressed in black, and she's weeping. She killed him; what’s she weeping about?! He didn't take out a big enough insurance for me! That’s why she’s weeping. The people who keep quiet are wise people. I mentioned it last week. A bank manager, even if he's insulted, he keeps quiet. But if you walk outside the manager’s office and see the janitor, he gets angry even if you look at him funny. That's why he's a janitor. You have to learn how to take it. And therefore, what should you say to your mother-in-law. Listen to me. Erase it - not only from your mouth, from your memory! And that's being smart! If you’re going to keep on thinking about it, it's chas v’shalom a sore; a sore on the lungs, a sore on the liver, a sore on the stomach. Chas v’shalom. And someday it could erupt suddenly and make a big tragedy, chas v’shalom. And therefore you are wise, not only spiritually wise, but even in gashmiyos - you are a wise and prudent person if you'll erase it entirely from your mind. If a person's parnasa is decreed on Rosh Hashanah, then why does he have to go out and work? Let him lie in bed all day. And the answer is as follows. This is how it is decreed. It's decreed on Rosh Hashanah that if you'll do this and this in the upcoming year, then you'll get this and this. And if you do so and so, you'll get so and so. That's what's decreed. And if you do something else, you'll get this and this. We think it's a simple thing. We think that a certain amount is inscribed and that's all. No! Hakodosh Boruch Hu does things in a subtle way and it's far beyond the ability of a human being to understand. Certainly it's decreed. Certainly. But what is decreed? If it's decreed that a person is going to have a full year of happiness for the upcoming year and then he decides to go and bang his head against a brick wall just for fun; he wants to bang his head three or four times against the wall. So what are you going to say? That since it was decreed that he'll live happily this year, the brick wall will be as soft as mush? No. It'll be as hard as brick. So the decrees are decreed only under certain conditions. And if you go with those conditions, then that's what you're going to get. Exactly as Hakodosh Boruch Hu decreed. And if you choose a different path, then you will get exactly as He decreed under those conditions. However, you must also know, that if a man tries to outdo what was decreed, then he's going to be disappointed. And that's because there are maximums that are decreed. Her response should be a nod and that’s all. If it’s a person you know, you should acknowledge his greeting with a nod and keep on going. And if it’s a stranger, then act as if you didn’t even notice him. Now, exactly how a girl should behave when it comes to greeting men deserves really more than a few minutes; it’s a complicated question. Because if somebody greets you then according to the gemara - actually it’s a Mishnah: Hevai mekabel es kol adam besever ponim yofos - You have to greet everybody with a pleasant face." And also you’re expected to smile at people. However, that’s men with men and women with women. When it comes to men with women and women with men, it needs a peirush. It needs a peirush - it depends on the circumstances. But just to answer the question briefly, then that’s enough. The girl should acknowledge the greeting - after all, a man that you know greeted you - acknowledge it and keep on going. If they would allow me to come into a nursing home and talk, I would wait until they come to the lunch hour when they give watermelon to everybody. And I would say, “Old people wake up: before you sink your teeth, or your false teeth, in that luscious watermelon, stop and enjoy the color! Isn't that a beautiful color! Why should it be red? It could have been a pale white color. How should a mother and housewife get the feeling of the approaching yomin noraim, if she's so busy with the preparations for gashmius? That's a good question. A women in the kitchen, she is busy preparing, cooking and baking; so how can she prepare? If she would think at the time that she is doing these things, “what's the purpose of all her work”? She is doing this as a kindliness to the people of her family. Why is she practicing kindliness to her family? Just because mothers do it everywhere. In Bensonhurst an Italian mother is also cooking and baking for her family! And in Bedford Stuyvesant a black mother is also doing the same, so what difference is there? That's the gemora, the gemora says, ma hu chanun af ato chanun. Just like Hakadosh Baruch Hu is merciful, so you, and v'halacto b'drachuv. And therefore it's a great pity if you don't know this, so it means that you're just imitating the nations of the world. The same is for a doctor. 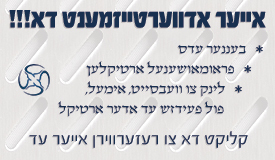 If a doctor realizes that Hakadosh Baruch Hu is rofei cholei amo yisroel, and the doctor as he dispenses advice and medicines thinks, “I am doing the agency, I am a shaliach for Hakadosh Baruch Hu”, that's one of the noblest missions in life. Isn't it a tragedy that people live their lives and do great things and forget that their chief function in life is to emulate Hakadosh Baruch Hu? העושה דבר עבירה ומתבייש בו איז א מדריגה! 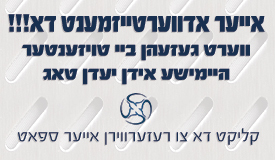 בראש השנה יכתבון וביום צום כיפור יחתמון. דאן, אויף וואס דאווענען מיר א גאנץ יאר?! And the answer is that at every moment a man can reverse the decision. Everything that Hakadosh Baruch Hu decides on Yom Kippur is decided conditionally. For instance, a man is inscribed for life until next year. But suppose he decides that he wants to jump off the roof. So Hakadosh Baruch Hu says "Go ahead and do it". Everything is on condition that you don't choose to frustrate it. If a man wants to lose what he would have gained by the decision on Yom Kippur, it is his privilege to forfeit it. Now of course that's limited in certain ways, but in general we have to know that's the truth. All the gezeiros are subject to certain restrictions. Even a gezeira for evil chalilah, if a man does real teshuva and he cries out with all his heart, in some cases it can help. Because the gezeira is made conditionally, unless he does teshuva. And therefore it always pays for a person to utilize the situation properly. It could be that what was decreed for him was merely conditional and his prayer will overturn it. קודם מלוך על כל העולם כולו בכבודך, און דערנאך סלח ומחל לכל עונותינו! Why is Yom Kippur not before Rosh Hashana, so we will be able to enter Rosh Hashana clear of sin? Here is a man who needs an operation on his bladder, or maybe also on his ulcer, or maybe he needs an operation on a number of things. But instead, we are sending an expedition to his house with a lot of noise and a lot of people are running towards his house, trucks are making a tremendous clamor with sirens to put out the fire. This man needs a lot of operations so why waste time? The answer is, first you have to put out the fire otherwise he will never live to see the operating table. First thing is to save his life if his house on fire. So you say no! Let the fire wait, lets first make an operation on this, an operation on this, later you'll put out the fire...It won't work that way. Therefore the first thing is Emunah in Hakadosh Baruch Hu, that's emergency, that's a fire. If you forget about Hakadosh Baruch Hu, you forget Anochi Hashem Elokecho, then what good is all the rest? What good is it to eat kosher if a man is an atheist, even though he doesn't say so but he is so? If he doesn't believe in Bereishis Boroh Elokim what good is it to go further? That's why it's put in the beginning of the Torah. And that's why Rosh Hashana must come first, to bring us to do teshuva in the fundamental, the foundation of everything, then we're ready to talk about the details. די עיקר עבודה אום ראש השנה: ה' מֶלֶך, ה' מָלַך, ה' יִמְלוֹך לעולם ועד! If Rosh Hashana is the Yom Hadin, the day that Hashem is judging us, shouldn't we spend the whole day saying vidui and confessing our sins? On Yom Kippur we're busy saying Ashamnu, Bugadnu, Guzalnu. We spend the whole day admitting our sins. Now, why don't we do that on Rosh Hashana, you ask. It's a day of judgment. Why don't we confess our sins on Rosh Hashana? There is a very good reason why we don't say vidui on Rosh Hashana. The answer is that there's something even more important to do on Rosh Hashana. We have more vital business to transact, and that's the business of Hashem Melech - the business of recognizing that Hakodosh Boruch Hu is around. You know, I mentioned before that there are people who are pious in details. But they are not pious in the generalities. They don't believe much in Hakodosh Boruch Hu. Although they believe in kashrus, and in shabbos, and in taharas hamishpacha, and they won't shave with razor blades. And all that's wonderful. They sit in the sukkah, they buy an esrog, wonderful! But they don't remember Hashem enough. They forget about Him. So, Yom Kippur is for the details. Of course you must speak about the details. Certainly! Certainly if a Jew has sinned, he has to atone for that. But on Rosh Hashana we have to devote time to the premise, the foundation. And the foundation of everything is yiras Hashem - to be aware of Hashem. And that's why on Rosh Hashana, instead of spending the day bent over saying Slach Lonu and Ashamnu, bugadnu, we spend the day on our feet shouting Hashem melech, Hashem malach, Hashem yimloch l'olam va'ed! - Hashem was always the King, Hashem is the King now, and Hashem will be the King forever and ever. Because that's the message that has to strike home on Rosh Hashana. And once you become aware of Hashem, once you get into your head that Hashem is King, then you'll be ready for the details of Yom Kippur. How Does One Reach Perfection? We're put in this world to be formed into something beautiful. And so a pummel here... and a knock here.... and a punch here. We think it's all a waste. We would like to get along without it, but that's making us, it's rounding us out, and it's smoothing us. It's making us into what we are supposed to become. Part of our being in this world is in voluntary perfection. That which excites a man, serves as a test by which his worth is recognized, When after a banquet on man is enthusiastic over the words of the Torah which has been spoken, another praises the songs, and a third lauds the food. Each one's praise indicates his worth. Is A Jew's greatness only in his superiority over nature? Man is great. The superiority of man is over all the trees, over the continents, and over the universe. The vastness is also between the station of a gentile and that of a Jew. We are already staggering at the first superiority, and now the second we can't begin to think, as our minds would be numb. What does the Gemara mean when it says simana milsa hi with regards to eating the simanim on Rosh Hashanah (Horiyos 12a)? How is eating a carrot or gourd a good siman for the new year? There's a big question that is asked. Why do we need tefillah? When you're thinking, Hashem knows your thoughts, so why should you have to speak it out at all? It seems like a waste of energy. And actually, it's a good kasha. And the answer is that when we speak out the words of tefillah it's a more powerful expression then just thinking alone. It makes more of an impression on your mind when you speak out words. Now, if you do a mai'sah, then it's even more powerful. That mai'sah becomes a tefillah. It's a mai'sah of tefillah. So when you eat that vegetable or that fruit and you are thinking and you are saying that this year should be a shanah tova u'misuka, you're adding a mai'sah to your tefillah and you're making it that much more powerful. When you dip the apple in the honey, let's say, and you say that this year should be a shana tova u'misuka, don't just say it as if it's some sort of segulah to give you a sweet year. No, not at all! The act of dipping it in the honey and taking a bite of that apple is a very important part of tefillah. The right thing is to think, and to say, "I'm dipping this apple into the honey as a tefillah to you, Ribono Shel Olam, because I want You to give me a year that is as sweet as honey. Please give it to me. Please look at my mai'sah as a mai'sah tefillah. Please give me a sweet year." You must think these thoughts. What?! Are you going to dip the apple in the honey the same way a little boy in cheder dips the apple?! Are you going to waste the opportunity?! The Rav said tonight that we should get busy before Rosh Hashanah remembering all the good that Hashem has given us since last Rosh Hashanah. But don't we have to spend the time we have left thinking about our sins and our behavior over the past year and making resolutions for improving this coming year? You'll recall that I said the words, "as part of our work." Really, there's so much work to be done, that we don't have time in the ensuing period, until tomorrow at sunset, to do what has to be done. But remembering all the good that Hakodosh Boruch Hu gave us this past year, and thanking Him for it, is most surely a very important part of our preparation. So instead of worrying about fitting it all in, I'll tell you what to do. You make sure to think for five minutes about the past year - about all the good that Hashem has given you since exactly one year ago. Do that and you'll be a great man. And then another five minutes about resolutions for the coming year. And then you'll be an even greater person. Those ten minutes will be a great accomplishment. If after sitting here for an hour and a half, you'll go out and think for five minutes, you should know that you're an exception. You're a dagul mei'rivavah - you're one out of ten thousand. There's nobody like you. Who thinks for five whole minutes about gratitude for Hashem for the past year?! And who thinks for five minutes about making resolutions for improving himself in the coming year?! People talk about it. But that's all. That's why I said in the beginning of our talk, that if you do this on a small scale, then you shoot up and your head is way above everybody else. Who should we vote for President? We should vote for the one who appears to us to be the most conservative. Now, I can't tell you who that is. But there's no question that the conservatives of today are extremely more liberal than the liberals of thirty years ago. We have already advanced so far beyond the borders of liberalism, that today we can afford to retreat many miles behind these boundaries and still remain at the forefront of liberalism. And therefore, today there's no such thing as too much conservatism. You have to vote for conservative candidates on every level - on national, state and city levels. That's my opinion. By the way, nobody here has to agree with me - on anything. Only, I don't have to agree with you either. Every year, before Rosh Hashana comes along, I make kabolos about improving myself in various areas of my service of Hashem. But here I am, the same schlepper I've always been. Let me tell you something. You're not the same. Don't think you're the same. You're getting worse! As time goes on, ovar adam aveiro v’shono bo naasis lo k’heter - "One who does a sin, and then repeats it again and again, it becomes permissible in his eyes" (Yoma 87a). So if you're not improving, you're getting worse. When you make a kabalah bli neder you have to have something specific; at least one specific thing that you're going to work on changing. Tofasto meruba lo tofasto - If you try to grab too much at one time, you're going to grab nothing at all. It's all going to fall out of your hand. To say in general, "I'm going to be good this year," is better than nothing, but not much better. You have to specify something clearcut. Say, "This year, no matter how mean my wife is to me, and how much she'll bother me and criticize me and nag me, I won't say anything impolite to her. I'll keep my mouth closed." That's already something specific, something you can grab on to. Tofasto muat tofasto. It's something limited, something that you can grab onto. And actually, even though it's something specific, it's not so small in Hashem's eyes. The possuk says Toleh eretz al belimah - "The world hangs on nothing" (Iyov 26:7). And Chazal tell us that it means the following: Ein ha'olam miskayem ela b'mi she'b'oleim piv b'shas meriva - "The world exists only on account of the person who keeps his mouth closed at a time of provocation" (Chulin 89a). The zchus, the merit, of keeping your mouth closed when people are insulting you is a very big zchus. So start with your wife. You can start with somebody else as well. Let's say you have an employer who insults you, keep quiet. You want to keep your job don't you? So keep your mouth closed. Make a kabalah, "I'm going to keep quiet. I won't answer back." It's a tremendous thing to do that. So you have to pinpoint it, something clearcut. And then you'll be able to carry it out. Don't talk in general. General means nothing at all. Let's say you want to daven with kavana. You can't just say, "This year, I'm going to daven with kavana." It's too much to grab onto at once. Make up your mind that you're going to fight to get that first bracha. Every word in Magen Avrohom - that first bracha you're going to get down clearly. And don't let go of it. Hold on to it. Tofasto muat tofasto. Take a little bit at a time and hold on to it. Tofasto, means that you're holding on to it. Hold on to that little bit very tightly. Let's say you made a kabalah to learn Torah. So don't say, "I'm going to start learning more seriously this year." It's too big, too vague. Do it like this: "Bli neder, I'm going to learn fifteen minutes every day no matter what." And then, do it. Learn every night, fifteen minutes; it's better than nothing. At home, fifteen minutes. No matter what! Take out a sefer and learn for fifteen minutes. You want to learn an hour, very good, I'm not stopping you. But every night, learn fifeeen minutes. Or go to a shiur every night. That's even better. Every night no matter what. That's a kabalah that's a davar sh’yesh bo mamash, it's clear-cut, it's something you can sink your teeth into. Now even though sometimes there's so many more things that you should be doing as well, that you're not doing, but at least there's one thing you are doing. And Hashem sees that you're headed in the right direction. And if you're headed in the right direction then habo l’taher mesayim oso - If you're trying to get better, He'll help you go further and further" (Menachos 29b). But you have to at least do one thing! And then you'll get siyayta dishmaya to do more and more. Why do we wish people a ksiva v'chasima tova and a gmar chasima tova? Doesn't the judgment of Hashem on Rosh Hashana and Yom Kippur go according to your deeds? What's a bracha going to help? Absolutely a man is judged according to his deeds. But tefillah helps. So you ask, why does your tefillah help? If you're judged according to your deeds, why do you pray? You're going to be judged according to your deeds, that's all, so why pray? And the answer is, that's part of your deeds. When you pray that's part of your deeds. And the deeds of somebody else can also help you. The zchus of other people can also help you, yes. And by the way, when you're praying on Rosh Hashana and Yom Kippur, and every day as well, you say Sholom rav al amcho Yisroel tosim le'olam. You pray for for the whole Jewish nation, not only for yourself. You say it b'lashon rabim. You say kosveinu and chosmeinu. "Write us in the book of life." And we're thinking, "Hashem, remember us. All the members of our shul. All the people who come to our shiurim. Our wives. Our children. Our grandchildren. All the bnei yeshiva. All the Yeshivos. Satmar Yeshiva. Mir Yeshiva. Chaim Berlin. Bobov. Torah Va'daas. Passaic. All the yeshivos. And all the girls' schools. Beis Yaakov, Yeshiva of Brooklyn, Prospect Park, all the frum girls. Then, all their fathers and mothers. All the Jews who keep kashrus and Shabbos and taharas hamishpacha. All the Jews who are busy keeping the Torah." We say, "Hakodosh Boruch Hu, bless them." The Slobadka Yeshiva in Eretz Yisroel. And Chevron. And Mir. And Ponovezh. Say it; say it with your mouth. Not merely thinking. With your mouth say it. "Ohhh," Hakodosh Boruch Hu says. "You're fulfilling what you want Me to do. Now I see that you mean business." If you want Hashem to bless the Am Yisroel then you should get busy giving blessings. And that's what we say in Sim sholom. We say kosveinu - all of us! You have to always think about other people. And Kol hamevakesh rachamim al chaveiro ve-hu tzorich le-oso dovor hu neeneh techilah. If you pray for others, you get the first results for yourself. It's so important to think of other people. Think of the Jewish nation in general, but also think about the details. You can think of your father-in-law and your mother-in-law, besides your own parents. Think of your cousins, your children, your grandparents, your grandchildren. Think about all of them. You can say their names too. Not in the middle of Shemonah Esrei, but at the end make sure to say it. Say the words. Give a bracha to all Jews. When you pass by a house and you see a big mezuzah, say "You should all have a Gmar Chasima Tova ." Did you ever think about that? Absolutely. When you pass by a house, you should say, " Gmar Chasima Tova." Who's listening? Hashem is listening. Hashem hears you! And that's more important than the people in the house hearing you. This is very important what I'm telling you now. It's not a small matter. That's why we say the whole davening b'loshon rabim. Some people think that rabim means "We." [The Rav pointed at himself]. People think that Refaeinu and Borcheinu means, "Bless me," "Heal me." The royal "We." "We means me," he thinks. No; we means we. All of the loyal Jews. Al kol Yisroel amecho. The whole Jewish people. We love the Jewish nation. I love the Jews in Teiman. I love the sefardi Jews in America. I love the chassidisheh Jews in Williamsburg. We love everybody. All frum Jews, we love them all. Some of them are much better than us. Much better. And we love them anyhow. We love all frum Jews. We love Boro Park. Say that. Say, "I love Boro Park! I love all the frum Jews in Boro Park. Ribono Shel Olam, watch over all of the Boro Park frum Jews and all of the Flatbush frum Jews." Say it! And Hashem says, "Oh; now I see that you mean business. You're blessing my children. And now I'll get busy blessing you." What does it mean when we ask Hashem for life and we say Lema’ancho Elokim Chaim - "Let us live for Your sake Hashem"? The words Lema’ancho Elokim Chaim, for your sake Elokim Chaim mean more than one thing. But one important thing is this. Hakodosh Boruch Hu wants to give us a great gift, the gift of knowing about Him. And it's a tremendous gift. Now, the fact that you believe in Hashem is very nice. But it's not enough. It's too weak, it's too pale. Hakodosh Boruch Hu wants us to think about Him and know Him more. And therefore, when Hashem gives us a favor, some form of kindliness, one of the purposes - actually the most important purpose - is so that we should say, "Oh, Hashem, now we see that You are kind. You're so good to us. We thank You." That's why a beautiful peach is given such a fine color. A blush on each cheek. Why is the peach so beautifully colored? Besides for tasting good inside, why is it so beautifully colored? Because Hashem wants you to enjoy the peach even more. And why does Hashem want you to enjoy it? Enjoy the peach so that you can thank Hashem: "Oh Hashem, I thank You for this peach. Thank You Hashem." That's the purpose - to thank Him. Hashem, You're Zon es Ha’olam, You feed the whole world, but not only do You give us food, but You do it b’chein b’chesed, ub’rechamim. You do it with kindliness. And as we are learning about the kindliness of Hashem, we are gaining more and more knowledge of Hashem. The more you appreciate what Hashem does for you, the more you gain knowledge of Hashem's kindliness. And that is a tremendous benefit for us. And therefore we say, "For Your sake Hashem, give us life." "For your sake," means, "You Hashem want us to learn about You, because that's our success in this world. So give us a happy life, and we promise You Hashem, that this coming year we're going to utilize every day to say, "Thank You Hashem for today." Today we began the seventh day of the new year! "Oooh, we thank You Hashem." Seven days already! Seven days! Are you thanking Hashem?! Right now, thank Him. Right now! It's already seven days. Soon it will be seventy days. Soon it'll be three hundred and sixty five days. Soon it'll be Rosh Hashana again. Did you thank Hashem for that yet? Every year it comes, and you forget to thank Hashem. So your first obligation is to thank Hashem for what He did for you already. When you use your life to thank Hashem, that's Lema’ancho, that's living for Your sake, Hashem. You want us to know about You. And the more we enjoy what You give us, we're going to think about You more and understand You more. So the coming year, when you eat, "Ahh, I thank you Hashem for the good bread." When we wash with soap, we thank Hashem for the soap. "Ahh, soap is such a wonderful thing. Oh, soap is so wonderful." You drink water, you thank Hashem. You take a bath, you thank Hashem. You put on clothing, you thank Hashem for the clothing. You breathe the air, you thank Hashem for the air. "Oh, now I see that you know how to live," Hashem says. "That's living for My sake. I'm giving you these things for My sake, so that you should appreciate who I am." And that's your success in this world! Hashem says, "That's your success in life. If you would understand that I am the mekor hachesed, the source of all kindliness in the world, then that's living for My sake. Then you're living for Me and that's what I want you to do." That's Lema’ancho Elokim Chaim. תשובה שלימה איז שווער אדער גרינג? In some seforim they make it sound like doing teshuva is not so hard. It's a process, but it's not so hard. But in other seforim it says that it's a big avodah of changing who you are completely. What's the truth? In order to explain that, we have to ask: What does teshuva mean? What are you returning to? There are two kinds of teshuva. In order to repent for your sins, there are certain things that you must do, minimal requirements that you must be aware of, and then you have fulfilled the mitzvah of doing teshuva for that sin. You have to have charota, regret for your sins. Then you have to resolve that you won't return to those sins. You have to have kaboloh al ha’osid that you will forsake your evil ways. And you also have to ask Hashem for mechilah, and you have to say vidui. Now, these are not very simple matters, but when you do these things properly you have fulfilled the basic requirements of of teshuva. But there is another teshuva, much more difficult. A much higher teshuva. And that is Shuvu Yisroel ad Hashem Elokecho - Come all the way back to Hashem. Not just to "do teshuva" but to actually come back to Hashem. That is the real teshuva that Hashem wants from you. And that teshuva is endless. The pursuit of shleimus, of the perfection of trying to get close to Hakodosh Boruch Hu, is a life long endeavor. Moshe Rabeinu tried all his life and although he succeeded enormously, nevertheless he didn't fully succeed. Nobody can succeed completely. Shuvu Yisroel ad Hashem. Come back to Hashem, which means not merely to stop doing aveiros. Hashem wants you to be perfect, as perfect as you can be. And that perfection means returning to Him, by keeping Him before you all the time. All day long. That's teshuva. All your life you must strive for more and more perfection. And it's a chiyuv, an obligation! Hashem says to us Mi yitein v’hoyoh l’vavchem zeh l’yirah oisi kol hayomim - "If only their hearts would remain this way always, where they recognize My Presence before them" (D'varim 5:26). Hashem wants from us that same attitude that they had at Matan Torah when they heard the voice of Hashem. It was tremendous! Everyone was overwhelmed by the d'var Hashem at Har Sinai. The voice of Hashem! And Hashem said, "I want it to always be that way!" How could it always be that way?! That's a very difficult avodah, a teshuva that involves coming back to Hashem. So real teshuva, the Teshuva Shleimo, is a very real undertaking because there's a lot of work to do to achieve that attitude of feeling the presence of Hashem always. But it's an attitude that all of you can achieve. It just takes work. All our lives we have to strive to do the best we can, by constantly seeking more and more shleimus, by coming back to Hashem as much as possible. The more you think about Hashem, the more you are coming back to Him in real teshuva.